Indianapolis patient came in for crooked, discolored, mal-positioned teeth and gum asymmetry. Patient didn't like to smile and covered mouth when laughing. Looking for a smile makeover to enhance an already gorgeous smile. Placed 10 porcelain veneers to improve color, shape, length, golden proportions and tissue contouring with a diode laser. A beautiful smile makeover with porcelain veneers and a diode laser. Teeth that look completely natural and beautiful. An excellent result that enhances an incredible smile. A multidisciplinary approach for Fishers patient who came in to discussthe option of surgery for Condylar Hyperplasia. "I just want my teeth fixed"! Over closed with a 12 mm Shimbashi. Sent to Orthodontist for Arch form correction and then placed in an orthosis for a trial run with form and function taken into consideration. Tens bite was spot on and stabilty and function were achieved. Patient thrilled with this new Neuromuscular position. Tissue asymmetry, arch form, function, color, shape, vertical dimension and length. Upper arch was also built out to enhance the smile. Upper prepared and finished to a lower fixed orthosis at a Shimbashi of 18mm. Lower then finished 2 months later. Porcelain veneers,crowns and an implant crown were used to finish case.Placed in a Sleep Appliance for mild sleep apnea and protection for night time grinding / bruxing. A win - win for all. So rewarding to improve appearance, form and function. Not just cosmetics but function and airway. What a powerful profession we are in to be able to dramatically change a person's life !!!! Exceptional result for an incredible Carmel, Indiana patient.Natural beauty in this smile rejuvenation. Carmel, Indiana patient came in complaining of headaches and bite issues.She felt like she didn't have a consistent and comfortable bite and wanted to improve her teeth.After doing a thorough Neuromuscular work up, she was Tensed with a QuadTENS and placed in an anatomical orthosis. Her headaches were eliminated and she felt like she had a home to go to as far as her bite was concerned. She felt like the tension in her jaw muscles were eliminated and her cervical neck issues had improved. She felt such an improvement overall that she wanted to be in the new bite position permanently. This full mouth rehabilitation and smile rejuvenation patient was restored to her new bite position in two phases.The upper arch was restored to a lower fixed orthosis. After stabilizing the bite the lower arch was restored with beautiful porcelain veneers and crowns.These patients often experience health improvement that are not always expected. Not only were her headaches and muscle tension relieved but she was commenting on how much younger she looks.Her face looks much more relaxed, her eyes are more symmetrical and her chins no longer deviates to her left due to placing her condyles in a more natural position. When patients are over closed and lack vertical dimension they often appear scrunched up and more mature. Opening the bite or increasing the vertical dimension often gives a more youthful and vibrant appearance as seen with this extremely happy patient. Full Mouth Reconstruction case addressing crooked teeth,stained and leaking restorations,golden proportions,converting a canine to a lateral,converting a premolar to a canine,deficient vertical dimension,axial inclinations,arch form,negative corridor,color and length. Neuromuscular TENS bite used to establish ideal physiologic position to enhance form, function and airway. Orthosis worn to establish real time comfort and function. Upper prepped and delivered to a lower fixed orthosis. Lower then finished 3 months later. Porcelain veneers and crowns used and gum tissue sculpted and enhanced with a Diode laser.Beautiful veneers and crowns that give a natural appearance and beautiful smile. Headaches and cervical discomfort eliminated with this new physiologic bite position. Major self esteem and discomfort improvement for a Carmel, Indiana patient with this smile rejuvenation !!! Airway improvement achieved with a more open and forward jaw relationship.Helping patients in ways other than just teeth.Love what we do. A single tooth challenge with this Zionsville patient. He has a short discolored front tooth that has kept him from smiling. Just wants a natural looking tooth to match his existing front tooth. Tooth had a root canal a number years ago. One of the biggest challenges for a cosmetic dentist is to match an adjacent tooth that is a totally different color than the tooth being restored. Extensive training and attention to detail with a talented lab and great photography is critical to create an incredible natural looking porcelain veneer restoration. Natural looking Porcelain veneer delivered on the first attempt. Photography and stump shades of the prepped tooth give the talented lab the tools to determine the proper translucency and opacity used in the porcelain ingot to fabricate this beautiful Empress porcelain veneer.Hard to tell which one is the porcelain veneer and which one is the natural tooth. Close up look at the above existing discolored, shorter tooth.Pictures were take with shade guides next to discolored and adjacent teeth. Porcelain veneer provided a great looking natural restoration that fulfilled the size, shape and color of the final restoration. This Las Vegas patient presented with many challenges and a desire to improve his smile with a smile rejuvenation.No dramatic bite change needed.Patient has discolored teeth, missing lateral which he currently uses a removable tooth flipper to fill in the space, tissue asymmetry, size, shape, length discrepancies and golden proportion issues that will be addressed in the final restorations. A beautiful and natural looking result in a otherwise challenging case.Porcelain veneers, crowns and a bridge were used to create this drastic smile make over.Patient did not want an implant to replace the missing lateral. Tissue re- contouring was achieved with a diode laser at the prep appointment.This was a home run considering the challenges of multiple underlying tooth colors, shapes and sizes.The tissue re-contouring really adds to the proper tooth contour, fabulous teeth with a natural looking smile. Closer looks reveals the challenges of size, shape, color and alignment.It is a form of instant orthodontics except the teeth need to be prepped to achieve the desires results. Porcelain veneers and a crown were utilized to achieve a dramatic and pleasing result. Patient was thrilled with the final appearance.The power of porcelain is dramatic. Carmel, Indiana patient presented with old broken down silver mercury fillings, Gold inlays have survived the test of time well but remaining tooth structure needs help. Notice the cracks that have developed. Patient was having some biting pressure and cold sensitivity with all three teeth. Teeth were cleaned up and composite cores were placed where needed.Two porcelain crowns and a porcelain onlay fabricated out of Empress Porcelain were used to restore teeth back to their original form and function.No more biting pressure and cold sensitivity were experienced by the patient after restorations were placed.Almost invisible restorations !!!! Cosmetic dentistry isn't just for the front teeth. Fishers, Indiana patient came in with cold and sweet sensitivity to teeth. Old broken down silver mercury fillings were starting to leak more and decay noted both clinically and on Diigital Xrays. An unsightly look to say the least. Old silver mercury fillings were removed along with decay and unsupported tooth structure. Composite cores were placed where needed.All three teeth were restored with beautiful Empress Porcelain inlays in a very conservative fashion.Only decayed and unsupported tooth structure was removed.Because this treatment was started sooner than later and we had adequate healthy tooth structure remaining, we were able to eliminate the need to crown all three teeth.Minimally invasive dentistry at its best.The power of BONDING and PORCELAIN !!!! Westfield, Indiana patient came in with cold and sweet sensitivity on a upper premolar tooth. An old leaking silver mercury filling was detected as the culprit.Notice the crack on the left of the filling. These metal fillings don't have the same bend as a natural tooth and have the tendency to crack/fracture teeth. All of the Amalgam filling was removed and a composite core was placed.A beautiful and natural looking Empress porcelain onlay was bonded into the remaining healthy tooth structure to conservatively restore the tooth back to its original strength, No need to crown the tooth when early intervention is possible and plenty of natural tooth structure remains to bond into.Which tooth is it ? Indianapolis, Indiana patient presented with a broken lower molar. Patient was having cold and biting pressure sensitivity.One whole cusp broken off. Major leakage,bad taste and sensitivity noted by patient.After reviewing findings with patient and observing findings with Digital Xrays and intra oral camera the decision was made to fix all three teeth. All of the old amalgams, decay and unsupported tooth structure were removed. 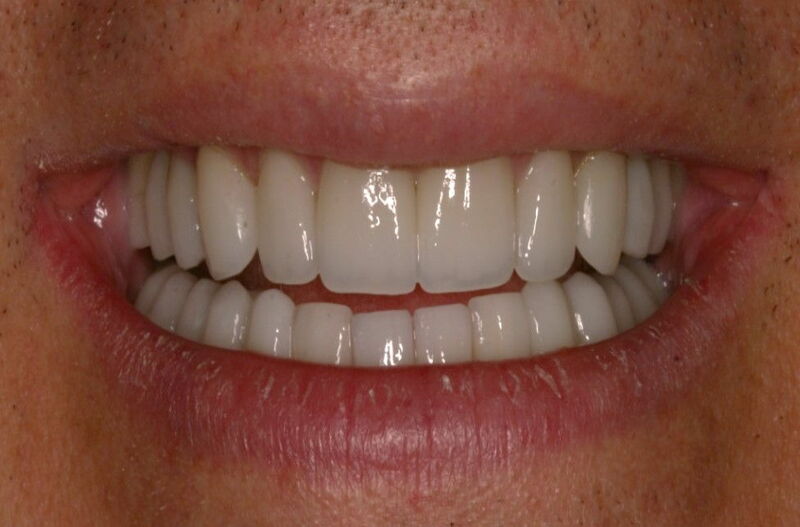 Composite core build ups were used as needed and teeth were restored with beautiful porcelain empress inlays and onlays. No crowns believe it or not !!!! Being able to treat teeth early allows the dentist more natural tooth structure to bond to and decreasing the possibility of crowning many teeth.This minimally invasive dentistry is a win/win for all. This Carmel, Indiana patient felt there was something not right with a couple of her back teeth. Cold and sweet sensitivity motivated her to seek an evaluation.These two old silver mercury fillings had marginal leakage and cracks noted with clinical exam and intra oral camera views.After viewing pictures of teeth and consultation with us on the pros and cons of different treatment options the patient decided to have them restored. All of the decay and bad tooth structure only were removed.With exceptional training and years of experience these teeth can be treated extremely conservatively.Minimally invasive dentistry allows dentists to remove decay and damaged tooth structure only and bond tooth colored restorations back into the teeth to strengthen them close to their original state. Two gorgeous Empress porcelain inlays were bonded into the teeth.No need to crown these teeth because early treatment left plenty of healthy tooth structure to bond to. Carmel, Indiana patient was having biting pressure sensitivity.Digital Xrays revealed decay underneath these silver mercury fillings. Intra oral camera and clinical views detected marginal leakage and cracks in all three teeth. Patient happy to get rid of failing amalgam restorations. All of the decay, old amalgam fillings and unsupported tooth structure were removed.Extensive decay required composite core build ups.All three teeth were restored with conservative BONDED Empress porcelain inlays/onlays. These highly attractive restorations allow the dentist to treat these teeth as conservatively as possible.Absolutely stunning COSMETIC results !!!!!! Patient could not believe how great these restorations looked. Indianapolis, Indiana patient came in for cold and biting pressure sensitivity on these upper teeth. Digital Xrays and clinical and intra oral camera views reveal failing silver mercury fillings in need of replacement.Cracks and fractures are noted on all three teeth along with marginal breakdown and decay. Treating these teeth in a minimally invasive manner requires an attention to detail to preserve as much natural tooth structure as possible.All of the decay and remaining bad tooth structure was removed and resin core build ups were used where indicated.Three natural looking Empress porcelain inlays were bonded into the remaining healthy tooth structure. Strong, solid, functional and beautiful. WOW. NATURAL BEAUTY. Fishers, Indiana patient came in for an improvement in the overall appearance of her teeth.Golden proportions,tooth size, shape color and tissue recontouring were addressed.Impressions were taken and an ideal wax up was fabricated be a master lab technician. Ten beautiful Empress porcelain veneers were made and bonded to the existing teeth.A Diode laser was utilized to recontour tissue asymmetry to enhance the overall appearance. A beautiful smile makeover to improve color, shape, size, length and tissue asymmetry.Filling the buccal corridors by building out the four posterior teeth was also addressed. An incredible result utilizing, golden proportions, diode laser, master lab technician, photography and impeccable lab communication.The dentist gets all of the accolades but the lab technician can make or break the case. Side profile illustrating color,shape,alignment,size and existing golden proportions. Side profile showing improvement in every category. Notice how natural and life like these porcelain veneers look. A stunning smile that was enhanced by cosmetic dentistry.Looking at the principles of smile design highly trained cosmetic dentists can transform a great smile to INCREDIBLE !!! Looking at golden proportions, color, shape, size, length,tissue symmetry, photography and working with a master lab technician with extensive training can create a Win / Win for all. Addressing all of the core principles of what makes a Porcelain veneer case so great allows highly trained cosmetic dentist to deliver at an extremely high level. BEAUTIFUL, STUNNING AND NATURAL.Changing lives in incredible and rewarding ways. Crooked, discolored,tissue asymmetry for starters. Fantastic natural looking porcelain veneers. The WOW FACTOR !!! Side view of the above case. Look at how natural and beautiful these Empress Porcelain veneers look.With the help of the Diode laser for tissue sculpting this smile rejuvenation is a WINNER. Patient came in for a smile make over evaluation.Does not like the look of her old veneers. With 10 Empress porcelain veneers and proper treatment planning and the help of a master lab technician, a beautiful and predictable result is accomplished. This case demonstrates the need to many times include the back side teeth to fill out the buccal corridor.If they are not included you get the appearance of the headlight look,,,,,,,,,,,,,,,,,,,,where you only see the front six teeth. This appearance gives a distorted and unnatural look.With proper training a highly skilled cosmetic dentist can take the existing tooth/smile template and transform it into a stunning smile full of natural looking teeth. Ten Empress porcelain veneers transforms this smile to a Vogue Cover look !!!! There is a natural asymmetry built into the case to give it a very natural and appealing appearance. Sometimes cosmetic dentists tend to over engineer a case to try to make it look too perfect. That is not the way nature works. Instead of denture looking teeth that look like a white picket fence, building a natural asymmetry will create a beautiful and stunning natural look. Side view of the above demonstrating the above challenges. How gorgeous and natural. They don't look like restorations.They look like real teeth. Indianapolis, Indiana patient came in for a smile makeover analysis.Was concerned about the color,worn teeth, shape, size and his unwillingness to smile he was concerned about how unattractive his teeth and smile were. Golden proportions, size, shape,color and length were addressed and used to dramatically change the teeth and smile with ten Empress Porcelain veneers.A Diode laser was used to recontour tissue asymmetry. Notice the beautiful contour and natural appearance of these Empress Porcelain Veneers. Tissue symmetry, teeth color and shape fit the skin tone and outline of the patient's face.Patient extremely happy with this fabulous result. Patient came for a smile rejuvenation. Wanting to change the shape and color of teeth.Smile analysis and golden proportions addressed to formulate an ideal treatment plan of 10 porcelain veneers. Ten beautiful Empress porcelain veneers were fabricated by a master lab technician to match the facial outline and skin tone of the patient's face. Notice the crowding and crooked teeth.With an ideal wax up made from the pre-op models the dentist can prep the case to where the teeth will be in the final restorations. A very natural looking set of Empress porcelain veneers enhances an already gorgeous smile.This is the power of cosmetic dentistry.A powerful way to create a new found self esteem with patients. Look at the beautiful anatomy built into the front aspect of the teeth.You you are.cannot tell these are porcelain veneers.Makes everyone want to smile even more.The More you smile the happier you are. An Indianapois, Indiana Patient came in for a smile rejuvenation.Concerned about the gap in between the two front teeth, color, shape, length and golden proportions.After impressions were taken and an ideal wax up was made it was determined that all of the concerns could be easily addressed with ten Empress porcelain veneers.These cases are often challenging but the ideal wax up provides the blueprint to achieve consistent and predictable results. Notice the drastically improved shape, color. length and golden proportions.The gap was filled in beautifully creating a very natural appearance. Patient thrilled with the final result. Carmel, Indiana patient came in to have us evaluate the possibility of improving the appearance of her front teeth. Doesn't like the color and overall shape of the teeth.Has a four bridge on the upper right. Doesn't want to get implants.Proposed replacing bridge and placing three Empress porcelain veneers on the three right front teeth. A major transformation for this very happy patient.A new four unit bridge and three new Empress porcelain veneers made a major change for this patient.A Diode laser was used to do some minor tissue sculpting to enhance the overall final result.What a major improvement. Top and bottom teeth were restored with Empress porcelain veneers and crowns to the new Neuromuscular bite position.This was done in two phases.The top was restored to a lower fixed orthosis and after a month of validating form and function the bottom teeth were restored.Minimal adjustments were needed due to the precise technique that we use and teach.This full mouth rehabilitation can be a very big undertaking but the end result is determined before starting the procedure and patient goes on a trial run in the orthosis before any teeth are restored.A win / win for all involved. A Carmel. Indiana patient came in with numerous concerns.Golden proportions, size, shape, color, crowding and headaches. A major smile rejuvenation was needed.Patient was TENSed with ULFTENS and placed in a Neuromuscular orthosis to reestablish her vertical dimension and bite comfort. An ideal wax up was done to the new bite position established by the orthosis made from the TENSed bite position.Patient absolutely loved the new bite position and form and function could now be re-established with a full mouth rehabilitation.Patient did not want orthodontics but a new smile that she could be proud of. The top and bottom teeth were restored with Twenty eight Empress porcelain veneers and crowns to the new Neuromuscular bite position.This was done in two phases.The top was restored to a lower fixed orthosis and after two months of validating form and function the bottom teeth were then restored.Minimal adjustments were needed due to the precise technique that we use and teach.This full mouth rehabilitation can be a very big undertaking but the end result is determined before starting the procedure and patient goes on a trial run in the orthosis before any teeth are restored.A win / win for all involved.Sometimes you get the biggest hugs of incredible appreciation when these cases are finished. The impact we have on these patients lives is impossible to measure.Just a lot of gratitude by all involved. Carmel, Indiana patient came in for a routine cleaning appointment. Chief complaints were symptoms of sweet and cold sensitivity on some back molar teeth.Clinical exam, Digital Xrays and an intra oral camera were used to diagnose and plan out the appropriate treatment that was best for the patient.All Margins of these silver mercury fillings were leaking as decay was noted clinically. All of the decay, amalgam filings and unhealthy tooth structure were removed.Because these teeth were treated in a timely fashion and the original size was small, composite white tooth colored restorations were used to restore these teeth back to close to their original strength.Since these teeth were bonded the restorations are virtually seamless to prevent further leakage and breakdown.This is where a minimally invasive approach becomes an incredible service to the patient. BEAUTIFUL, STRONG AND NATURAL !!! An Indianapolis, Indiana patient came in with numerous concerns.Golden proportions, size, shape, color, crowding and major headaches.Wanted her teeth fixed but had no idea there was a relationship between her bite and her headaches.She was having difficulty functioning because the headache were so bad. Function was addressed first before a full mouth rehabilitation was even considered.Patient was TENSed with ULFTENS and placed in a Neuromuscular orthosis to reestablish her vertical dimension and bite comfort. After wearing orthosis for one week the majority of her headaches were eliminated. An ideal wax up was done to the new bite position established by the orthosis made from the TENSed bite position.Patient absolutely loved the new bite position and form and function could now be re-established with a full mouth rehabilitation.Patient did not want orthodontics but a new smile that she could be proud of and less headaches. Twenty eight Empress porcelain veneers and crowns were used to restore her teeth to her new headache free Neuromuscular bite position. This was done in one phase.The top and bottom were prepped and temporized at one appointment.Three weeks later all twenty eight Empress porcelain veneers / crowns were delivered .Minimal adjustments were needed due to the precise technique that we use and teach.This full mouth rehabilitation can be a very big undertaking but the end result is determined before starting the procedure and patient goes on a trial run in the orthosis before any teeth are restored.A win / win for all involved.A lot of happy tears at the delivery of these natural looking porcelain bonded restorations. Final twenty eight stunning porcelain veneers and crowns delivered correcting golden proportions, size, shape, color, crowding (esthetics) and major headaches (function).A beautiful smile looking even better.This is a life changer.The power of cosmetic dentistry is very evident in this result.Her quality of life just got better by addressing function and esthetics at the same time. This is a picture of the twenty eight temporaries in the mouth immediately after the all of the teeth were prepped.This allows the patient to get a glimpse of the look of the final restorations and to be able to make any adjustments before final restorations come back from the master lab technician.This is always a very rewarding time to see the patients reaction to the major change in function and esthetics that just occurred.Changing the quality of a persons life is a very humbling experience for all involved. This is the before arch form of the lower teeth.Notice the major crowding and chipped teeth. This is the lower arch after final delivery of the fourteen porcelain veneers and crowns.This is a major improvement in every aspect measured. This is the upper arch form of the above Indianapolis patient.Function and esthetics are very compromised. Hard to believe but these are the final fourteen porcelain veneers and crowns after delivery of the top arch.The improvement is dramatic.Beautiful esthetics enhanced by ideal form and function. Absolutely love this result. No headaches and a unbelievable cosmetic result. Fishers, Indiana patient wanted a smile rejuvenation. This is a challenging case due to the underlying tetracycline staining and tissue asymmetry.Patient was concerned about color, shape, size and length.With proper planning these cases are resolved very predictably with incredible cosmetic results. Ten porcelain veneers and crowns were used to restore the teeth.Photography, stump shades,an ideal wax up.precise planning and an incredible master lab technician made this case a life changing improvement.A diode laser was used at the prep appointment to sculpt the tissue to create more of an ideal symmetry.this can certainly make or break a case. Before picture of the above. After picture of the above. This Carmel, Indiana patient was ten years old. Patient was experiencing headaches, fatigue, snoring and a lack of stamina.Patient extremely overclosed.The plan was to re-establish a new more physiologic Neuromuscular bite position.Patient was TENSed with ULFTENSing and placed in a neuromuscular orthosis to that new bite position to establish a new physiologic functional position.Headaches were eliminated and fatigue and stamina improved dramatically. Patient was placed in two separate fixed orthoses on both sides.These were bonded into place over his primary teeth and a highly skilled orthodontist was able to erupt his permanent molars into this newly established Neuromuscular position.Once the molars were in occlusion the two fixed orthotics were removed to allow for the primary teeth to exfoliate and the underlying permanent teeth to erupt into the Neuromuscular bite position.This was a dramatic functional improvement. Westfield, Indiana patient came in for a smile make over.Wanted to get white teeth ! Addressed shape, size, color, length and tissue asymmetry.Digital Xrays and an intra oral camera were used to diagnose and treatment plan, Patient agreed to a ten porcelain veneer smile enhancement. Ten porcelain veneers were used to dramatically improve this patients quality of life.A Diode laser was also used to help improve the tissue symmetry. Patient couldn't believe what a difference we made in 5 hours total time during three appointments.Planning, photography and an incredibly talented lab technician make it all possible. Knowing what the end result will look like before you start with an ideal wax up is essential.You need a map/blueprint to get there,Proper training and experience a must. Noblesville, Indiana patient came in for an evaluation of his lower front teeth.He stated he doesn't like pictures taken of him because his lower teeth look bad.Wanted it fixed without orthodintics. Digital Xrays and an intra oral camera were used to educate patient and devise the proper treatment plan.Three porcelain veneers were used to bond to and restore teeth. 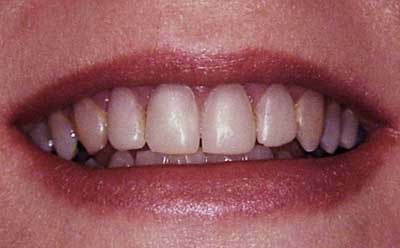 Final result of three bonded porcelain veneers used to create an instant orthodontic result.Orthodontics certainly could have been used to conservatively align teeth more ideally but patient did not want to go through orthodontics and more importantly the discolored front central would not have changed colors without the help of a bonded porcelain veneer. Fixed chips, alignment, color, shape and SMILE. Always challenging to match existing teeth but with the help of photography and lab communication a very pleasing result and ecstatic patient. A Indianapolis, Indiana patient came in with numerous concerns.Golden proportions, size, shape, color, crowding. A major smile rejuvenation was desired.Patient was TENSed with ULFTENS and placed in a Neuromuscular orthosis to reestablish her vertical dimension and bite comfort. An ideal wax up was done to the new bite position established by the orthosis made from the TENSed bite position.Patient absolutely loved the new bite position and form and function could now be re-established with a full mouth rehabilitation. 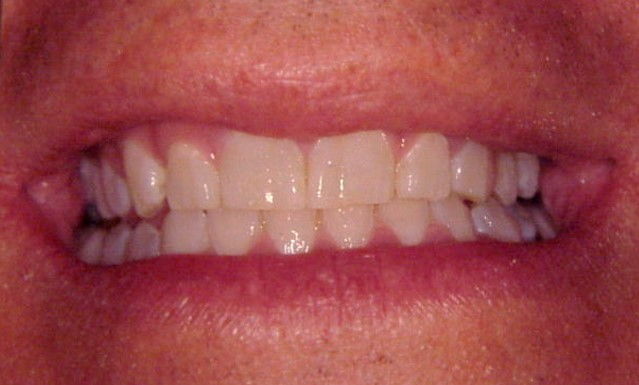 The top and bottom teeth were restored with Twenty eight Empress porcelain veneers and crowns to the new Neuromuscular bite position. This was done in two phases. The top was restored to a lower fixed orthosis and after two months of validating form and function the bottom teeth were then restored. Minimal adjustments were needed due to the precise technique that we use and teach. This full mouth rehabilitation can be a very big undertaking but the end result is determined before starting the procedure and patient goes on a trial run in the orthosis before any teeth are restored. A win / win for all involved. Carmel, Indiana patient wanted her front teeth fixed. Utilizing digital Xrays, photography and an intra oral camera a minimally invasive treatment plan was decided upon by patient. Due to the small size of the six front teeth and gaps between the teeth, a minimal prep veneer treatment protocol was decided upon. minimally prepped veneers allow the dentist to do minimal if any prepping on the teeth that will be bonded to with veneers. 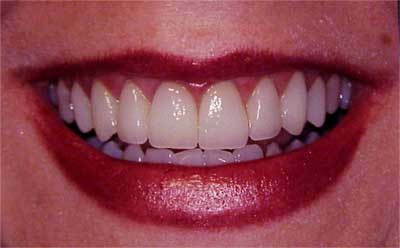 Six bonded porcelain veneers were used to restore self confidence and esthetics. These front six teeth only required a small margin prepped at the gum line to allow porcelain veneer to blend into the root and give stability when seating the veneer.A Diode laser was utilized to enhance tissue symmetry.A fantastic result with these natural looking Porcelain veneers.Happy patient means a happy TEAM.Nothing better that changing the confidence of an individual in 2 hours. WOW !!! Indianapolis patient came in for crooked, discolored, malpositioned teeth and gum asymmetry.Hated her smile and really didn't like to smile much. Looking for a smile makeover to enhance an already gorgeous smile. Placed 10 porcelain veneers to improve color, shape, length, golden proportions and tissue contouring with a diode laser. A beautiful smile makeover with porcelain veneers and a diode laser.Teeth that look completely natural and beautiful. An excellent result that enhances an incredible smile. A multidisciplinary approach. The patient came in to discuss the option of surgery for Condylar Hyperplasia. "I just want my teeth fixed"! Over closed with a 12 mm Shimbashi. Upper prepared and finished to a lower fixed orthosis at a Shimbashi of 18mm. Lower then finished 2 months later. Porcelain veneers,crowns and an implant crown were used to finish case.Placed in a Sleep Appliance for mild sleep apnea and protection for night time grinding / bruxing.